I love that in the aquarium hobby you can literally never run out of new and interesting things to stumble across, and you can never truly “know it all.” Sure, you can have hard-earned expertise in a particular genre of fish, perhaps, but at the end of the day, there is simply so much biodiversity out there that you can’t experience it all in one lifetime. Combine this with the conservation leanings that many aquarists seem to develop as they spend more time keeping aquariums, and I think we take on deeper appreciations for natural forms, and often start to make different choices than simply buying what’s pretty. I believe many experienced aquarists are starting to vote with their wallets for what we might call “meaningful biodiversity.” The definition of “meaningful biodiversity” is arguably a personal one, but I believe it’s what makes us gravitate to being “cichlid nuts” or “rainbowfish freaks,” devoting swaths of our fishrooms to particular subgroups of fish that we emotionally connect with. It’s the same underlying, intangible drive that causes some aquarists to become very involved in programs like C.A.R.E.S., to personally and actively engage in the Aquarium Ark, to ensure the survival of those little gray fishes that most people in the world don’t know about, and would never miss, should their time on this planet come to an end. I circle back from this tangent to use it as the basis for why I think Endlers, aka Endler’s Livebearer or Endler’s Guppy, Poecilia wingei, keep gaining attention and tankspace in the aquarium hobby, and why they capture my attention now and again. Sure, they’re lively and colorful, but the average domesticated fancy guppy easily beats the Endler in an epic smackdown of gaudy, over-the-top ornamentalism. Could it be that the Endler, particularly the pure “N-Class” (pure and never hybridized with Guppies) varieties, represent a more conscientious option for the aquarist who realizes that there’s more to keeping fish than simply the pursuit of ornamental extremes? It seems to me that the ethic of the killifish community is perhaps creeping into the livebearer world and becoming more mainstream. 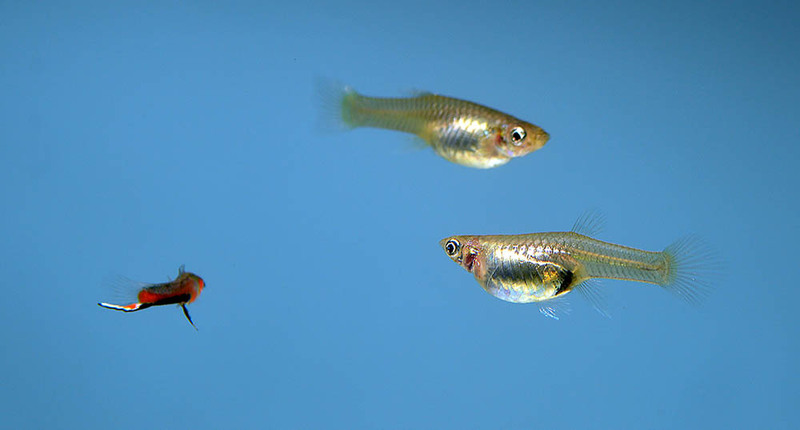 Knowing that we can, theoretically, trace certain Endler strains back to the wild, is a somewhat new concept, given that the classic guppy, which so often is held up as a beginners’ fish, is about as far removed from its wild roots as any tropical fish we could think of. Yes, there will always be a part of me that looks at an Endler and cynically remarks, “Looks like someone finally found a way to turn feeder guppies into premium big-ticket items!” But joking aside, I need only look at the pace of sales at retail shops selling other N-Class Endlers (such as Red Chest and Yellow Top Sword strains) to realize that these fish have hit prime time. As a breeder, I can’t keep ’em in stock, and the shops I watch can’t either. 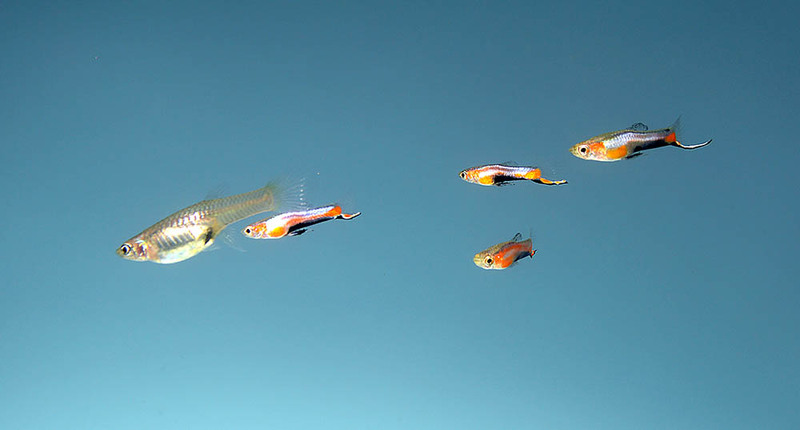 The rise of planted tanks and nano tanks has only helped further the demand for small, colorful, active fishes, and the almost ridiculously easy-to-keep-and-breed Endler fits the bill. Of course supply and demand rule the day, and local markets vary, but it’s interesting that older wild-strain Endlers are still price competitive with nicer quality fancy guppy strains. This demand for Endlers helps fuel the Aquarium Ark concept of piscine preservation, which is particularly germane given that some of the initial Endler population strains which entered the more mainstream hobby around the millennium are now thought to be extinct in the wild. The source for some of the older wild-strain Endlers, Laguna de Patos in Venezuela, has reportedly been polluted, wiping out the native Endlers, although it would seem there are some holes in this story. How Do We Keep Getting New Endlers? It is that first “additional” location which is the home of one of the newer wild-type Endlers, the Campoma Blue Star. It was collected in 2011 by Philippe Voisin, his son, Frédéric Nicole, and another unnamed friend, purportedly “under a bridge in Campoma village.” From there the strain was established and has then spread through Europe and then the U.S., Japan, and elsewhere. And along the way, some recently found their way into my fishroom from the fine folks at Geiler Aquatics (ironically, it was as an add-on purchase to some rare Victorian Cichlids I had forever been wanting to try keeping). The Blue Star phenotype was one of reportedly “thousands of patterns” which were sampled during the collection at Laguna de Campoma, which certainly suggests that Endler’s Livebearers aren’t extinct in the wild, even if their native range may consist of only a handful of coastal lagoons and lakes, which generally raises concerns. In a rare and unexpected find in these modern days, you can actually read about the collection of these wild fish and even see pictures of the foundation stock (reportedly in a plastic cup in a hotel room after collection), as posted by the one of the people responsible for it! An interesting side note: some online documentation suggests additional collections of other Endler phenotypes from the wild, as recently as 2013. Clearly not “extinct in the wild.” However, again, I can see cause for concern, given their apparently very limited range. Now, you all came here for a photospread, and it’s about time to deliver. Here’s a first look at the Blue Star Campoma Endlers I recently received. Unfortunately, the fact that their tank’s background is blue does them a particular disservice when highlighting their trademark coloration (blue is basically a new color in wild-lineage Endlers). Besides the fact that these breed like rabbits (I already have 10+ offspring in the tank after just a few weeks), one of my favorite aspects of these fish is the determination of the males. The pictures capture this behavior; no, Endlers are not schooling fish! I should probably separate out the girls to give them a break! What do you think? Are you keeping and breeding Endlers in your home? Please share your thoughts in the comments! Latest greatest research at molecular level still classifies Poecilia reticulata wingei var. Blue Star as a “Guppy”. Perhaps “hybridized with domestic Poecilia reticulata or wild-type Poecilia reticulata” would have been more accurate? Perhaps in the $3.99 world of big box chain store sales of commercially raised ornamental farm strains, but not in the world of pedigree Guppy breeding (to include all variants). Alan, thank you greatly for such thoughtful commentary. You’ve added something new to my own understanding of the species that current taxonomy recognizes as P. wingei. I’m not a taxonomist, nor ichthyologist or geneticist, but we generally (but not always) use Fishbase as our base reference for taxonomic standings. As such, for now, my use of P. wingei remains the name applied in this moment in time, although I can absolutely acknowledge the findings reported and referenced. Very interesting indeed. Your commentary gets to the heart of another concept I’ve written about and introduced in the marine breeding world; the concept that taxonomy is fluid, at least much moreso than biogeographic diversity at any given moment, and that taxonomy is absolutely the wrong “tool” or “metric” with which to make breeding choices when it comes to conservation minded breeding. That is to say, the “Red Clownfish From Fiji” has been, and always will be, the Red Clownfish from Fiji, regardless of whether we call it Amphiprion rubrocinctus, A. melanopus, or A. barberi. We may call this an Endler today, and a Guppy tomorrow…and something else 10 years into the future. But it will always be the “Blue Star” from Campoma. So too, knowing that the Campoma Blue Star Endler comes from a very specific locale, and is a singular representative from a larger polychromatic population, remains important information when it comes to the act, whether incidental or intentional, of preserving naturally-occurring biodiversity as aquarists. Now, I could debate the merits of whether we should line breed this particular phenotype and truly call that “preservation” of a population, when in fact the population clearly represents myriad phenotypes, but that’s a somewhat peculiar, and more nuanced debate, than the typical situation when we talk about say the captive arking of the monochromatic (and oft-claimed evil) Amphiprion mccullochi from Lorde Howe Island. Thankfully, other Campoma Endler strains appear to be running around the hobby, so perhaps I’m able to dodge the question of whether one phenotype is enough (? ), when it comes to making any sorts of claims regarding the preservation of natural biodiversity from a polymorphic species. Alan, regarding your assessment of my comments on pricing, yes, I largely agree. The best-of-the-best in any field is always orders of magnitude more expensive, and that wasn’t the comparison I was attempting to make. 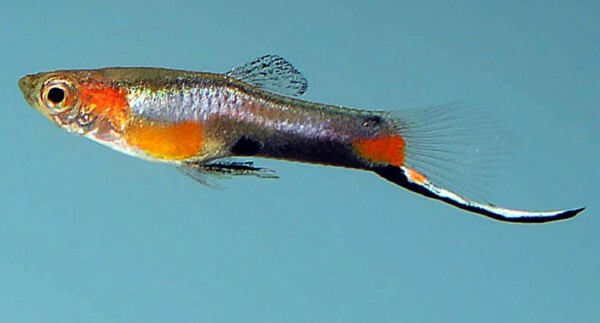 But even more interestingly, consider the defacto “wild-type” feeder guppy, which we can all agree at first glance falls into the casual ballpark of appearances with wild-type Endlers…once again, orders of magnitude differences in valuation for what the casual observer might consider “the same”. Maybe Endlers really are the “show quality” “feeder guppies” I joke about. Alan, I would love to read your elaboration on your last point, in part because I’m not sure I completely understand what you’re trying to convey, but also because I think it relates to my notes above regarding the polychromatic nature of wild Endler populations. I think this might fall in lines with my view on genetic mutations, which 10 years ago were extremely different than my views on them today. Please, if time permits, write back, it might make for further interesting discussion. Matt, Your reply is well worded, concise and on point. I think the main intent of my initial comment was to focus on the use of “common names; i.e. Blue Star, Guppy, etc…”, in both breeder circles and that of retail industry. It often causes much confusion, leading to misinterpretation, identification and dissemination of information among breeders. Especially when not formally documented in scientific publication or published breeder articles. Granted, a caveat that “Blue Star” has been heavily identified in articles re a specific Poecilia reticulata wingei phenotype with limited worldwide variation in breeder tanks. The term “Guppy” is valid collectively in reference to any and all wild-type populations of P. reticulata, P. reticulata wingei, P. reticulata obscura, or the offspring of inter-breeding’s in native range. As you point out WorldFish>Fishbase, and if I may add CAS>IBSS>Catalog of Fishes, still defer to peer reviewed Poeser (2005) in acceptance of his publication and naming of Poecilia wingei. Both databases, while the two premier online sources of fish identification and reference, are acknowledged not to be real-time updated. It will be interesting to see if either or both databases, in regard to recent publication of molecular level studies that do not support either incipient or sympatric speciation, reclassify the current status of Poecilia wingei as that of a species to variant Poecilia reticulata wingei, or simply treat as dissenting opinion, and take no action. While Endler / wingei enthusiasts quickly accepted species status, Poeser’s peer group has always appeared less willingly to accept results based predominantly on visible and cellular observations. Poecilia reticulata wingei phenotypes lack well defined nuclear core areas of habitation, with limited overlapping, commonly associated with parapatric speciation. They lack geographical isolation associated with allopatric speciation. There is little or no evidence of adaptation required for ecological speciation. Yet, as you suggest, wingei populations are very polychromatic in nature. As are those of reticulata. The two variants regularly interbreed, producing fertile hybrid intermediaries, as reproductive isolation is not complete. Cross variant hybridization between reticulata and wingei is fairly common place, female sexual selection preferences for specific phenotype(s) is not a complete isolating mechanism. Nor, is there any evidence of reproductive isolation between variants. Both wingei and reticulata preferences in turn also vary between local populations of each. Molecular level studies point towards distinct maternal families groups, often in overlapping variant populations. Wingei and reticulata phenotype is heavily based on Y-link mode of inheritance and to a lesser degree on X-link and autosomal mode of inheritance. Some of us breeders dwell in both the realm of domestication and preservation. Others, myself included, take it a step further and use hybridization as a tool for identification and production of new phenotypes. Few color / pattern traits are the result of mutation, more often the result of new combination of existing genotype in co-expression. 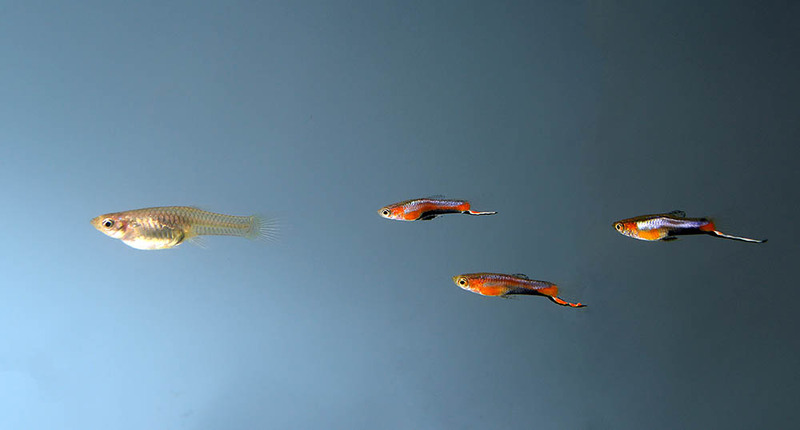 In the case of Domestic Guppies these are derived from all variant populations, and should be simply viewed as a “genetic toolbox”. 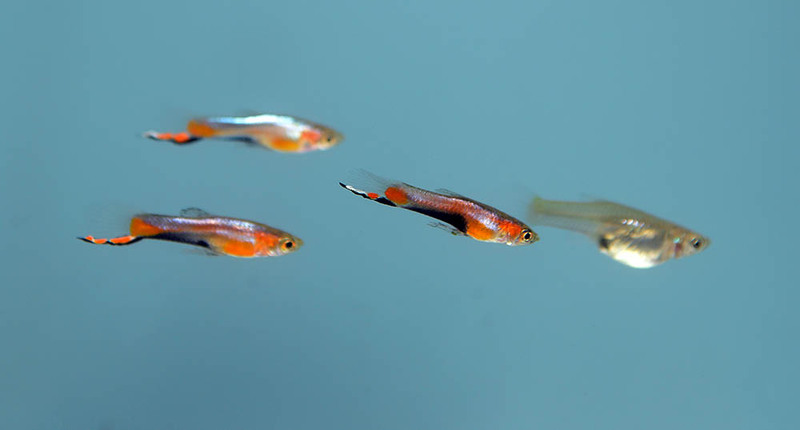 Captive bred modern Domestic Guppy strains are collectively the result of inputs from variant populations of P. reticulata, P. reticulata wingei and P. reticulata obscura. Poeser, F. N., et al. (2005), Description of Poecilia (Acanthophacelus) wingei n. sp. from the Paría Peninsula, Venezuela, including notes on Acanthophacelus Eigenmann, 1907 and other subgenera of Poecilia Bloch and Schneider, 1801 (Teleostei, Cyprinodontiformes, Poecilidae). Bijdragen tot de Dierkunde v. 74 (nos 1/2): 97-115. Schories, S., et al. (2009) Description of Poecilia (Acanthophacelus) obscura n. sp., (Teleostei: Poeciliidae), a new guppy species from western Trinidad, with remarks on P. wingei and the status of the “Endler’s guppy.”. Zootaxa No. 2266: 35-50. http://olmaca.com/swampriverforest/genera/Poecilia_obscura.pdf (last checked 5.21.16). Bias, A.S., (2.6.2014) The Never Ending Endler debate; A species or not?. https://www.academia.edu/11725448/The_Never_Ending_Endler_debate_A_species_or_not (last checked 5.21.16). Matt, Your reply is well worded, concise and on point. I think the main intent of my initial comment was to focus on the use of "common names; i.e. Blue Star, Guppy, etc...", in both breeder circles and that of retail industry. It often causes much confusion, leading to misinterpretation, identification and dissemination of information among breeders. Especially when not formally documented in scientific publication or published breeder articles. Granted, a caveat that "Blue Star" has been heavily identified in articles re a specific Poecilia reticulata wingei phenotype with limited worldwide variation in breeder tanks. The term “Guppy” is valid collectively in reference to any and all wild-type populations of P. reticulata, P. reticulata wingei, P. reticulata obscura, or the offspring of inter-breeding’s in native range. As you point out WorldFish>Fishbase, and if I may add CAS>IBSS>Catalog of Fishes, still defer to peer reviewed Poeser (2005) in acceptance of his publication and naming of Poecilia wingei. Both databases, while the two premier online sources of fish identification and reference, are acknowledged not to be real-time updated. It will be interesting to see if either or both databases, in regard to recent publication of molecular level studies that do not support either incipient or sympatric speciation, reclassify the current status of Poecilia wingei as that of a species to variant Poecilia reticulata wingei, or simply treat as dissenting opinion, and take no action. While Endler / wingei enthusiasts quickly accepted species status, Poeser's peer group has always appeared less willingly to accept results based predominantly on visible and cellular observations. Poecilia reticulata wingei phenotypes lack well defined nuclear core areas of habitation, with limited overlapping, commonly associated with parapatric speciation. They lack geographical isolation associated with allopatric speciation. There is little or no evidence of adaptation required for ecological speciation. Yet, as you suggest, wingei populations are very polychromatic in nature. As are those of reticulata. The two variants regularly interbreed, producing fertile hybrid intermediaries, as reproductive isolation is not complete. Cross variant hybridization between reticulata and wingei is fairly common place, female sexual selection preferences for specific phenotype(s) is not a complete isolating mechanism. Nor, is there any evidence of reproductive isolation between variants. Both wingei and reticulata preferences in turn also vary between local populations of each. Molecular level studies point towards distinct maternal families groups, often in overlapping variant populations. Wingei and reticulata phenotype is heavily based on Y-link mode of inheritance and to a lesser degree on X-link and autosomal mode of inheritance. You asked for clarification on my last point of initial comment, "While generally favoring pure wild-strain maintenance of this unique Guppy phenotype for purposes of this article, nice to see the author did not outright condemn the same in regard to ornamental strain propagation derived from wild-type variants. Some of us breeders and researchers dwell in both realms…" [sic.] Some of us breeders dwell in both the realm of domestication and preservation. Others, myself included, take it a step further and use hybridization as a tool for identification and production of new phenotypes. Few color / pattern traits are the result of mutation, more often the result of new combination of existing genotype in co-expression. 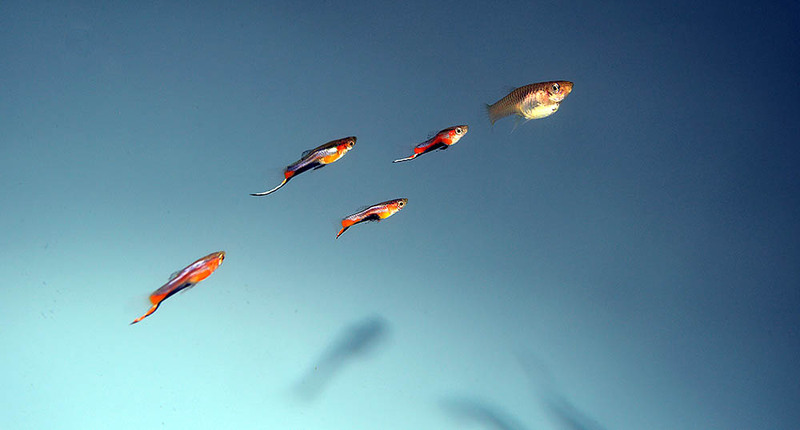 In the case of Domestic Guppies these are derived from all variant populations, and should be simply viewed as a “genetic toolbox”. 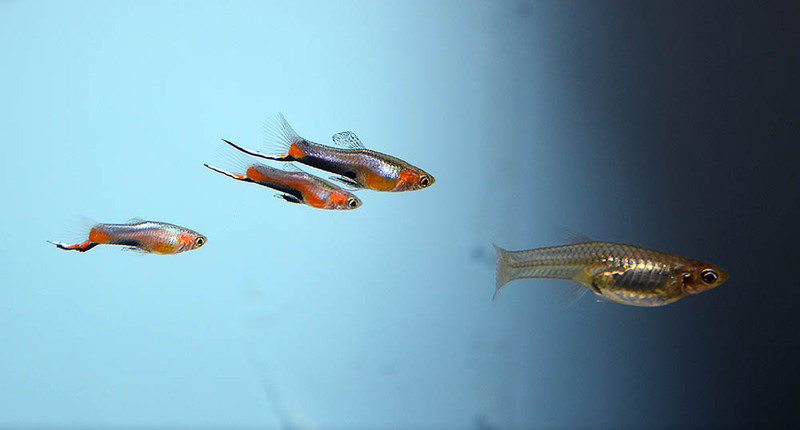 Captive bred modern Domestic Guppy strains are collectively the result of inputs from variant populations of P. reticulata, P. reticulata wingei and P. reticulata obscura. The majority of my nearly 100 tanks are allocated for Domestic Guppy breeding and cellular level research of color / pattern genetics. Yet, a portion contain extinct in the wild Xiphophorus couchianus, a wild-caught feral reticulata population, and at least one or two wingei phenotypes at any given time. Currently, one of which is a several hundred strong population of Poecilia reticulata wingei; var. Blue Star. This population is maintained line-bred in a community setting, with minimal selection inputs on my part as a breeder. In turn individual males are utilized for production of wingei x reticulata hybrids with latter females being X-link for doublesword trait and X-link & autosomal link for carotenoid orange color pigment. 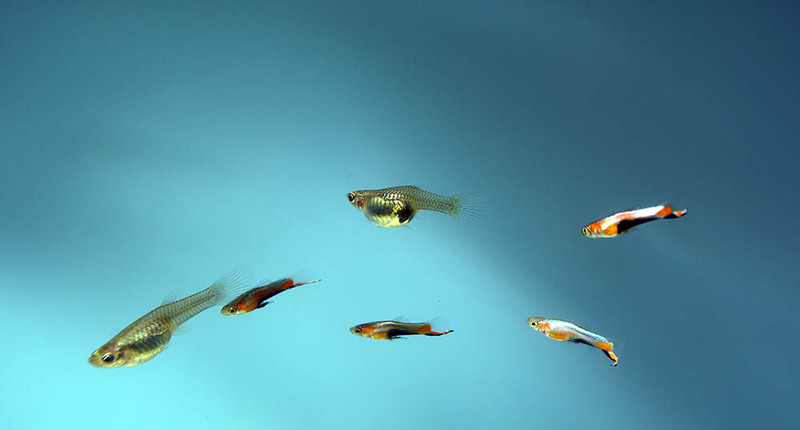 Hybrids are considered part of Domestic Guppy breeding program and always maintained distinct from purebred wingei population. So, I dwell in both worlds (domestication & preservation) with overlapping interests... P.S. Enjoy reading your publications… References: Poeser, F. N., et al. (2005), Description of Poecilia (Acanthophacelus) wingei n. sp. from the Paría Peninsula, Venezuela, including notes on Acanthophacelus Eigenmann, 1907 and other subgenera of Poecilia Bloch and Schneider, 1801 (Teleostei, Cyprinodontiformes, Poecilidae). Bijdragen tot de Dierkunde v. 74 (nos 1/2): 97-115. http://dare.uva.nl/cgi/arno/show.cgi?fid=43080 (last checked 5.21.16). Schories, S., et al. (2009) Description of Poecilia (Acanthophacelus) obscura n. sp., (Teleostei: Poeciliidae), a new guppy species from western Trinidad, with remarks on P. wingei and the status of the "Endler's guppy.". Zootaxa No. 2266: 35-50. http://olmaca.com/swampriverforest/genera/Poecilia_obscura.pdf (last checked 5.21.16). Bias, A.S., (2.6.2014) The Never Ending Endler debate; A species or not?. https://www.academia.edu/11725448/The_Never_Ending_Endler_debate_A_species_or_not (last checked 5.21.16).